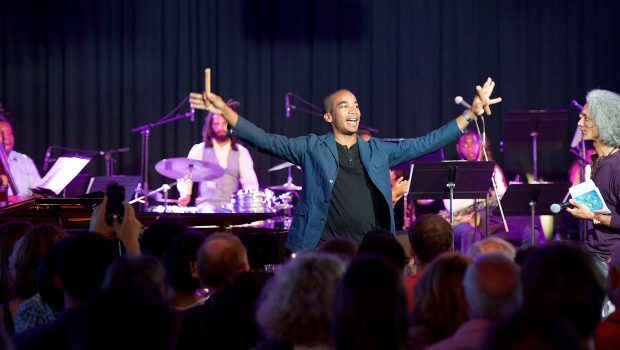 The Jazz Ticket London is set to open at Queen Elizabeth Hall in the Front Room at 4pm on Sunday 29 April with performers from last year’s nationwide music education and concert tour programme. Entry is FREE – Find out more on the Southbank Centre website here. The event continues at 6pm with The London Jazz Ticket concert featuring local London schools taking part for the first time, followed by Tomorrow’s Warriors flagship professional ensemble the Nu Civilisation Orchestra presenting a spectacular Finale concert – featuring some of the finest jazz musicians of the moment, playing pieces by the Jazz greats as well as New Music Biennial commission from Turner Sims, ‘A Journey with the Giants of Jazz’ by Peter Edwards. Special guest on the night will be Soweto Kinch. You can download ‘Journey with the Giants of Jazz’ from NMC Recordings here.